New scooter and motorcycle service centre located in the Sydney CBD suburb of Surry Hills. If you work in Sydney’s CBD and find getting your scooter or motorcycle to a service agent a hassle, there’s now a new workshop in the handy location of Burke St, Surry Hills. It’s called the Scooter Cycle Workshop. Owner Anthony, who has had 30 years industry experience, recently parted ways with Actions Motorcycles and started his own workshop, kindly filling a void where there are not too many options. Anthony will work on everything from scooters, stand alone engines, to the latest sports bikes. Fixed price servicing starts at $145 for scooters and $170 for motorcycles. Scooter Cycle Workshop can also fit tyres and perform pre-purchase inspections. 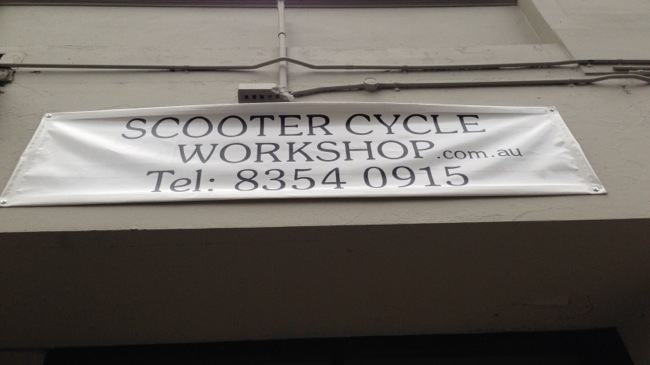 For bookings and further information call Anthony on 0418 447703 or you can email on scootercycleworkshop@gmail.com. The Scooter Cycle Workshop is located on the corner of Bourke and Short streets just behind Taylor Square, the official address is 2/342-344 Bourke St, Surry Hills. Need a scooter that can do it all. This is one maxi that's starting to gain some serious momentum in the marketplace. The MaxSYM 400i quietly slipped into the Australian market last year and it wasn't long before it started gathering momentum due to the high level of standard features and value for money. 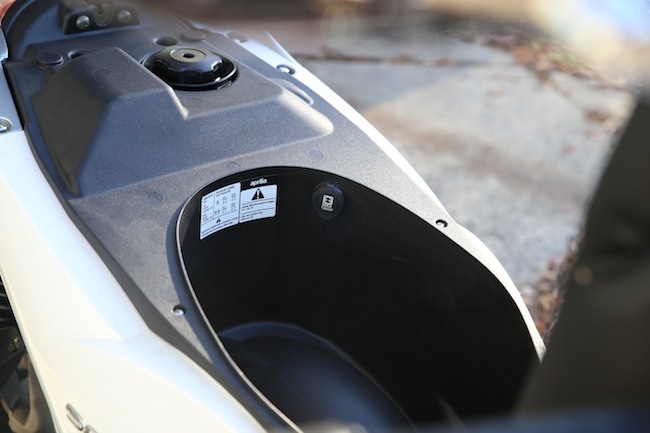 The positives are starting to flow and MaxSYM 400i owners are lumping praise on a scooter that can simply take care of any task. Short commutes and long touring capabilities in a scooter that’s easy to manage. Here's a selection of quotes from MaxSYM 400i owners. "This bike continues to amaze us, it seriously is getting better with age"
"It is rare in this day and age where our expectations are exceeded and the purchase of this bike was one of those very rare and pleasant experiences"
"MaxSym 400i where expectations are exceed by the experience - ride it you'll love it"
"It has been a replacement for my car with ample storage for a weekly shop, plenty of acceleration to deal with city riding and the comfort and steady speed to do long distance touring"
"The MaxSYM is the perfect daily commute for me. 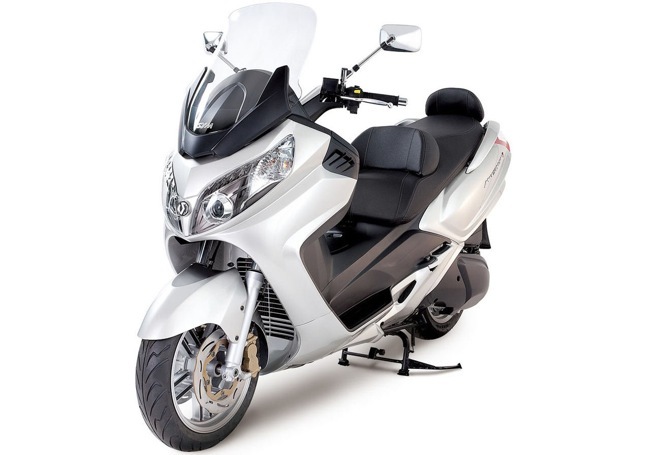 It's powerful & reliable and feels solid & comfortable to ride"
Some of the key features of the MaxSYM 400i include a smooth 399 cc liquid cooled, fuel injected engine that delivers 24.5 kw’s of power. 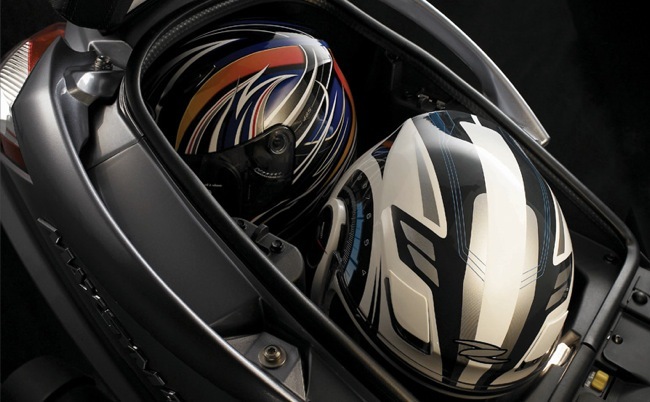 The seat height is relatively low (755mm) and you can fit 2 full size helmets under the seat. 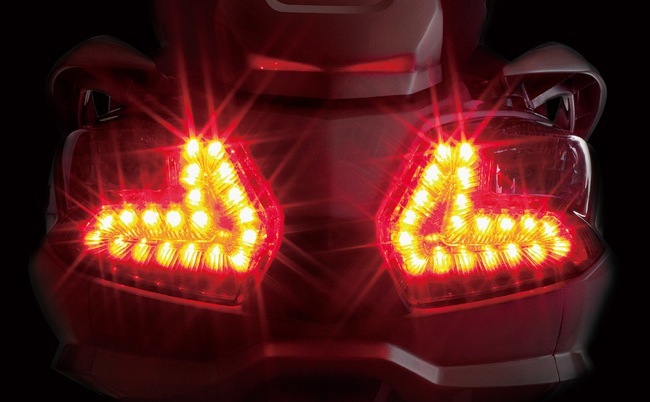 There’s the latest trend in LED lighting, a high protective screen and backrests for both passenger and rider. You’ll find ABS standard and huge 275 mm dual discs on the front. 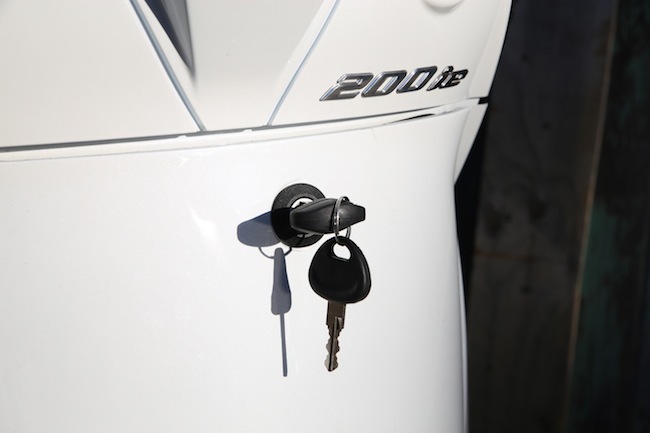 The MaxSYM 400i comes with a standard 4 year warranty and retails for $7,990 plus on-roads. Not bad for a scooter that will take you to any corner of Australia in comfort or down to the local cafe on a Sunday morning. This is one executive class maxi scooter that’s gaining an allegiance of fans all over the world. The Scarabeo is Aprilia’s mid-capacity all rounder, a scooter for all occasions. 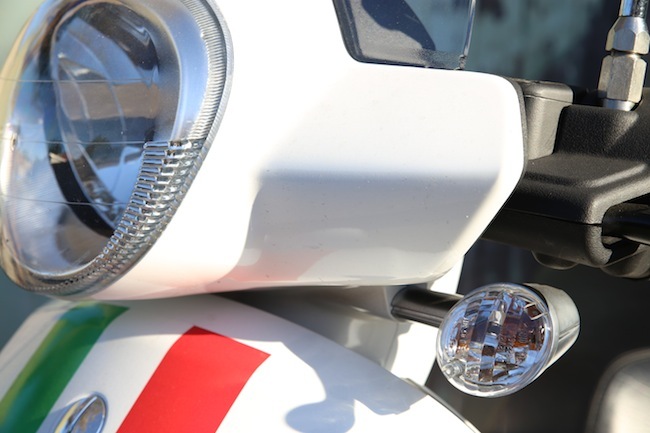 The Aprilia Scarabeo has never deviated from its original format. Big wheels and a flat floor layout make the Scarabeo an obvious choice for the avid commuter. We were given the Scarabeo 200 over a 3 month period and this gave us the opportunity to really see how ownership would be like over a longer period. We used the Scarabeo for everything, small commutes, longer motorway stints or loaded media expeditions - the Scarabeo was asked to do it all. First of all though, let’s recap. The Scarabeo 200 produces power well beyond its low capacity dictates. 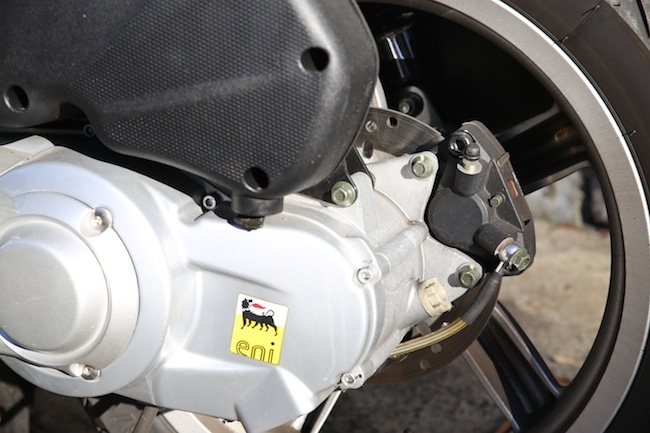 The 171 cc engine produces around 14 kw's and that’s edging close to the power outputs of many 250 cc scooters. The Scarabeo’s engine is both fuel injected and liquid cooled. It’s the ergonomics that appeal to me. The design and lines of the Scarabeo are pleasant. The seat is comfortable and I like the shape of the saddle and the way it forms around the rider. It’s large body and ever present weight give it somewhat the stature of a larger scooter. The Scarabeo is not small, so from a shorter riders perspective, some may struggle with the overall reach to the ground. Also the weight is immediately apparent, the Scarabeo comes with that reassuring sense of weight. I liken it to European built scooters where the increase in quality gives off this increased weight perception. 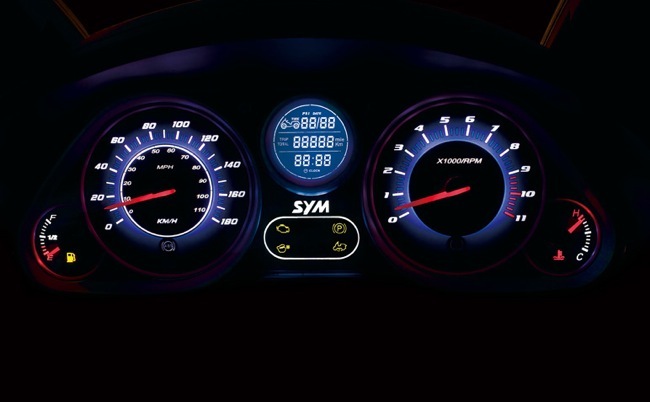 The dash is one of those dual analogue-digital types and provides ample information, even down to external temperature. You toggle using the mode switch on the right, this is one button I often get confused with the starter. There's a 12 volt charger under the seat and the seat itself opens via the ignition key. The floor, as mentioned, is fully flat with additional storage available under the seat or in the top box provided. The underseat area is good enough for a half helmet only. A small bag hook extends from under the seat. Between these three options I never found myself short. Adjustable dual shock absorbers take up rear suspension duties, the front is normal scooter fair, telescopic fork. Wheel size is 16 inch alloys front and rear, tyres are by Michelin. 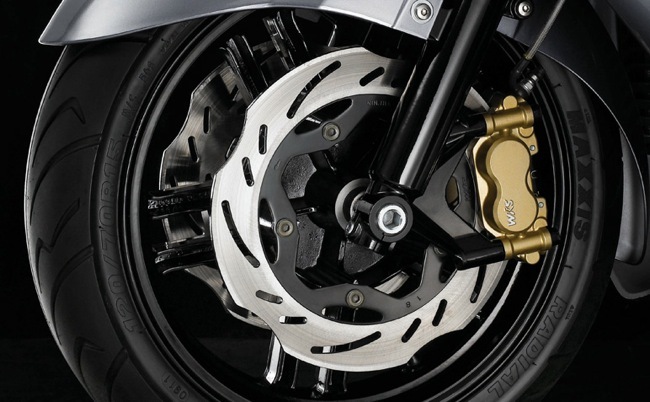 The brakes are linked with the left lever actuating both the front and rear brakes together. 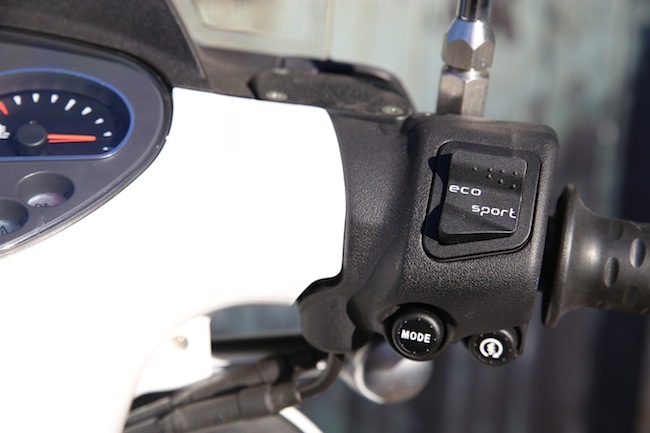 The right lever is for the 260 mm front disc only. Braking ability is ample and more than enough. After a few months riding the Scarabeo here are some of my thoughts. What is really apparent is that the Scarabeo will often perform tasks well beyond its scope. Remembering, here is a scooter that is only 171 cc’s in capacity, yet the Scarabeo will perform the role of a 250 cc scooter if needed. Especially when asked to cruise at 100 km/h plus speeds on the motorway, this is something the Scarabeo will do and do well. The seating position is upright, tall and enough to see over traffic. The screen is not overly high though it does help when motoring along, especially at higher speeds where buffeting is bearable. It's not perfect, though it's handy having the additional weather and wind protection. Riding the Scarabeo you quickly learn that you don’t need to strangle the accelerator to get the best out of it. 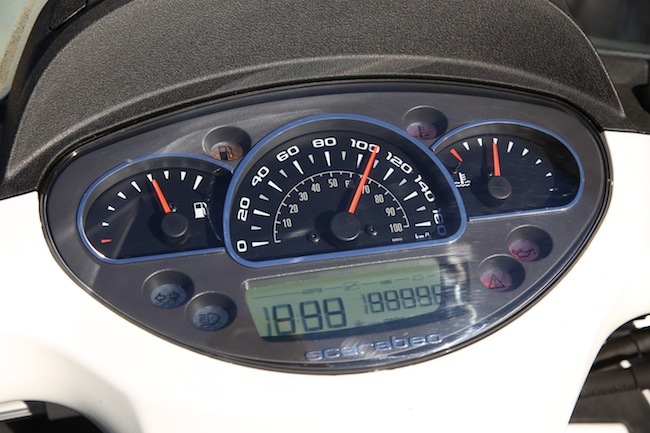 Half throttle is all you need, the Scarabeo will take a moment and gather momentum briskly. Two up and you will feel a small amount of lag off the line, this is the trade off with having the Scarabeo's higher speed capability. 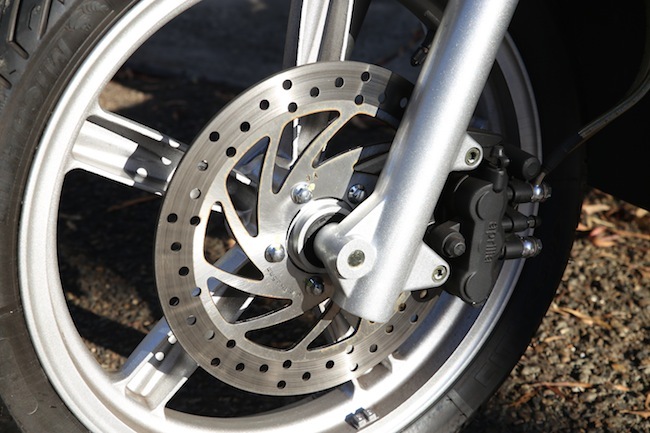 The big wheels ensure a really stable cornering ability especially when at 60 - 80 km/h speeds. Push the Michelin City Grips hard and the Scarabeo will stick to its chosen line and because the Scarabeo is no lightweight, the feeling will remain totally reassuring. Tyres remain sensitive to pressure so make sure you find the best settings for your weight. Mine just happened to be 32 PSI in the back and 28 PSI in the front. This helped greatly with low speed stability and when encountering unexpected road irregularities. Other notable mentions include storage. 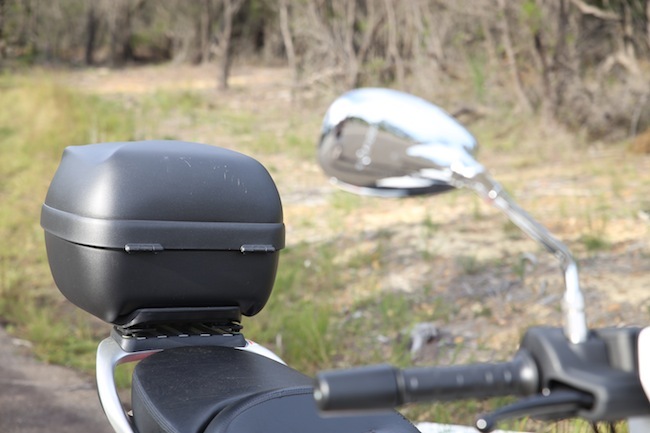 The Australian distributor offers a free top box with the Scarabeo so this minimises the issue with having a small underseat storage area. Remember the trade off with big wheels is less storage under the seat. Would like to see Aprilia add some external helmet hooks though. The cost of ownership needs mentioning. Lower capacity scooters will often fall into cheaper registration and insurance categories. This means overall cheaper running costs especially when factoring in third party personal insurance costs. Fuel usage was averaging out at around 27 km’s per litre and on average I was getting just over 200 km’s to the small 7.5 litre tank. The fuel gauge will sit at full for what feels like an eternity, after this it will briskly head towards the empty mark. The Scarabeo has a choice of two running modes - sport and eco. The Scarabeo 200 is a well sorted machine, the last round of updates made sure of that. The Scarabeo is an all-rounder that differentiates through its use of big wheels and willing engine. The Scarabeo makes light work of local commutes and is extremely capable of handling motorway speeds. It's a true all-rounder, a good first choice scooter, it's one you'll grow into and not out of too quickly. 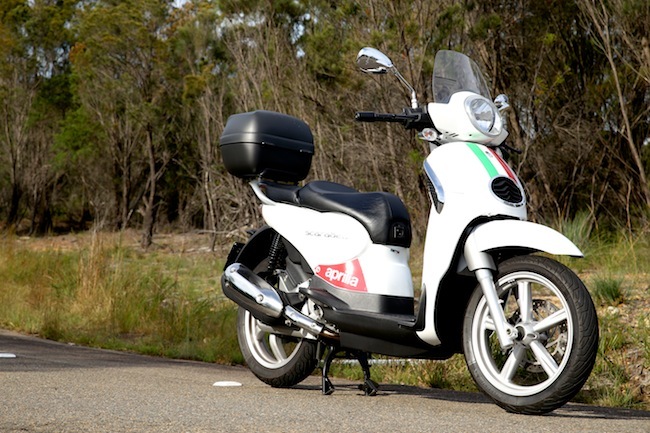 The Scarabeo is essentially a big wheeled classic, a competent and handsome scooter. Over time I found myself getting very fond of the Scarabeo, and as I often find myself surrounded by choice, you could see the Scarabeo being that one scooter you keep in the garage if all else had to go. 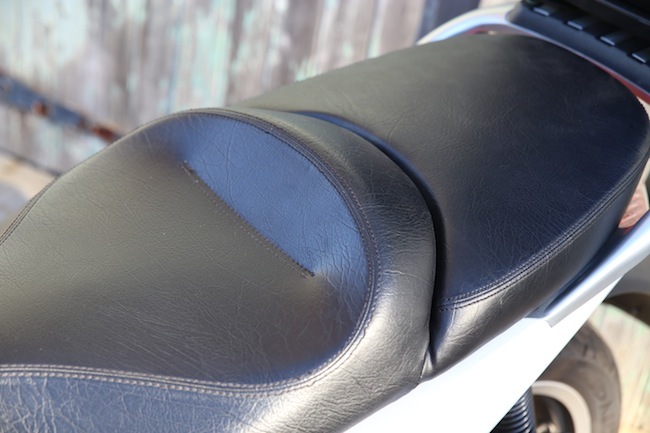 The Scarabeo comes in 3 colour options, black, white and my favourite colour - Royal blue with a tan seat. 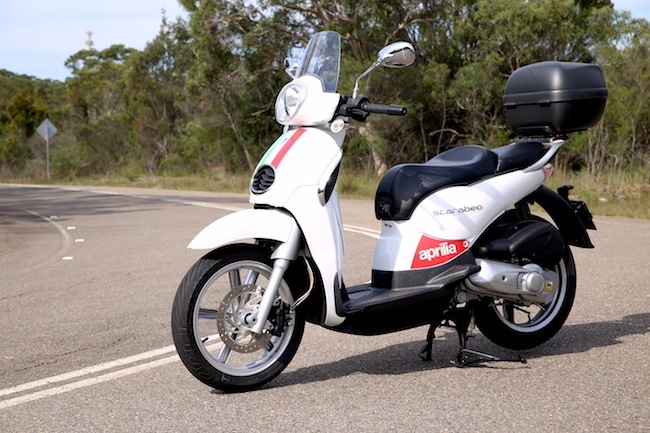 Whilst Aprilia's scooter range in Australia is shrinking, having excellent models like the Scarabeo helps. The Scarabeo will set you back just over $5,500 on the road.